I knew I had a challenge ahead of me. 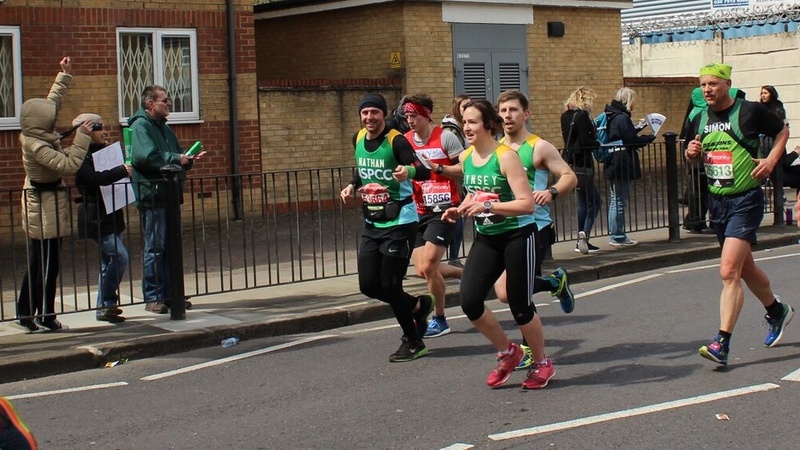 14 months prior to race day I had been approached by a charity to represent them at the London Marathon, part of a special team who would feature in the press to increase awareness. The months passed, as a hectic schedule of racing, work and writing landed me 980 meters above the Chamonix valley floor, descending on technical trails, enjoying freedom. However, this feeling was short lived as I rolled my left ankle, having time to observe the sole of my shoe. Unable to catch it, I feel to the floor, bellowing obscenities. Picking myself up, I managed to make it back to the start point and thus the tone of the following months was set. Physio, sickness, exhaustion. After years of living a built proof life, my body decided to experience all it could, side-lining me from running from September onwards. As time passed, I managed to get a few miles in here and there, but the reality was sooner or later I was back in bed. You couldn’t accuse me of over training. A few weeks before the big day I managed a couple of weekends in the Lake District and Snowdonia, racking up 40 and 30 miles respectively. It wasn’t easy, but I knew it was worth it. Having no training peak, I didn’t have to take into consideration tapering, and if anything, I would be at my fittest in the weeks following the marathon, instead of on race day itself. Now, I am one for punishment and gambling when my bodies involved. I set myself a bold target of 3 hrs 30 minutes, way faster than I should be able to comfortably get round in, but given the circumstances where finishing was the only goal, why not? Stood in the starting pen, after a brief appearance on the BBC preshow being interviewed with the team by Gabby Logan, the countdown from Tim Peak in the International Space Station commenced. “3,2,1…” it was time! Nerves dispensed and I felt strong, excited at the prospect of testing myself against the course. The first few miles kicked my weary body into gear, weaving in and out of a sea of bodies as optimistic times had placed them well ahead of reality. As my systems kicked in and muscles were at the right temperature, my pace quickened, my stride extended and my enjoyment rapidly increased. Pushing on, grabbing water at aid stations and avoiding the barrage of used bottles raining from the sky, littering the road ahead, taking out a few runners as they lost their footing on plastic bottles mimicking black ice. The cool air temperature greeted us with hail, a brief refreshment as the temperature rose, perfect for running but still warm surround by thousands of heat emitting bodies. Reaching Tower Bridge, half way, I felt strong haven’t downed a couple of gels and a swig of Lucozade. Passing the elite field, they were screaming along, 9 miles ahead, showing the potential the human anatomy has. Nearing mile 19, my good feeling came to a shuddering halt. My hamstrings started to tighten, my legs felt heavy and mentally, the realisation of 7 more miles struck home. Digging deep, I accepted my slower pace, maintaining consistency where possible. As the miles slowly moved by, 21, 22, 23, I could see 3hrs 30 was gone, but there was a still a prospect of breaking 3hrs 45 minutes. Pacers passed, 3 hrs 45 strapped to their backs and I kicked, determined to make the time. Entering the Mall, feeling done, there was 400 meters left to the finish line, lined by the grandstand where my partner would see me. Preparing for the finale, I unleashed all I had managing something of a sprint finish. Through the line I stopped the watch – 3:41:33 and the realisation I had overachieved. I was happy knowing with good health and training, I can push things further. I’d entered with 136 miles of training in the year and trepidation, most in the weeks preceding the race. I left with a new found respect for the distance, a better understanding of myself, my limitations and my mental strength. We plan for events in advance and do what we can to prevent any problems occurring on the day. But in reality, with a cool head, we can achieve more than a piece of paper may say. They often say endurance sports are 80% mental and it’s something I believe. To a point.